In obedience to an order of the Worshipful Court of Pleas & Quarter Sessions issuing from October Term A.D. 1863 to us directed me J.M. Taylor Willis Deans & Stephen D. Boykin the commissioners in the said order named have on this the 4th day of January A.D. 1864 proceeded to divide the slaves named in the order between Isaac Williamson & Eli Williamson the petitioner therein named & to allot to each is share in severalty. We have allotted & assigned to Eli Williamson the slaves Reuben, Margaret & her child Riney, Hittie & Elias; and to Isaac Williamson the slaves Harry, Jacob, Priscilla and Wesley and assigned to each of them the said slaves in severalty. In making the division as above we have allotted to Eli Williamson two hundred dollars in money out of the share of Isaac Williamson to make the division equal. Eli and Isaac Williamson were the youngest children of Isaac Williamson (1804-1855). The enslaved people subjected to this division probably represented their share of the elder Isaac’s estate, distributed as they reached adulthood. 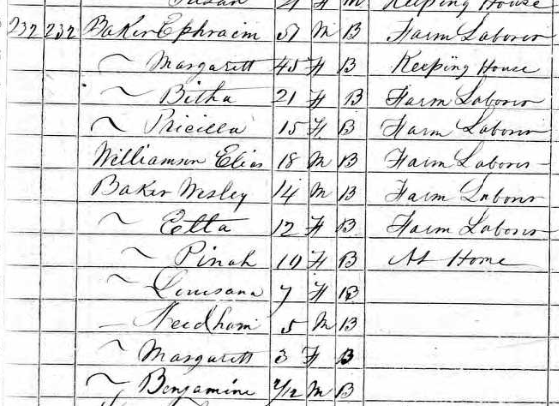 This household, listed in the 1870 census of Oldfields township, Wilson County, may show some of the people listed above, newly freed. Elias Williamson is probably the boy distributed to Eli Williamson, Margaret Baker may be the Margaret given to Eli, and Priscilla and Wesley Baker may be the children given to Isaac. 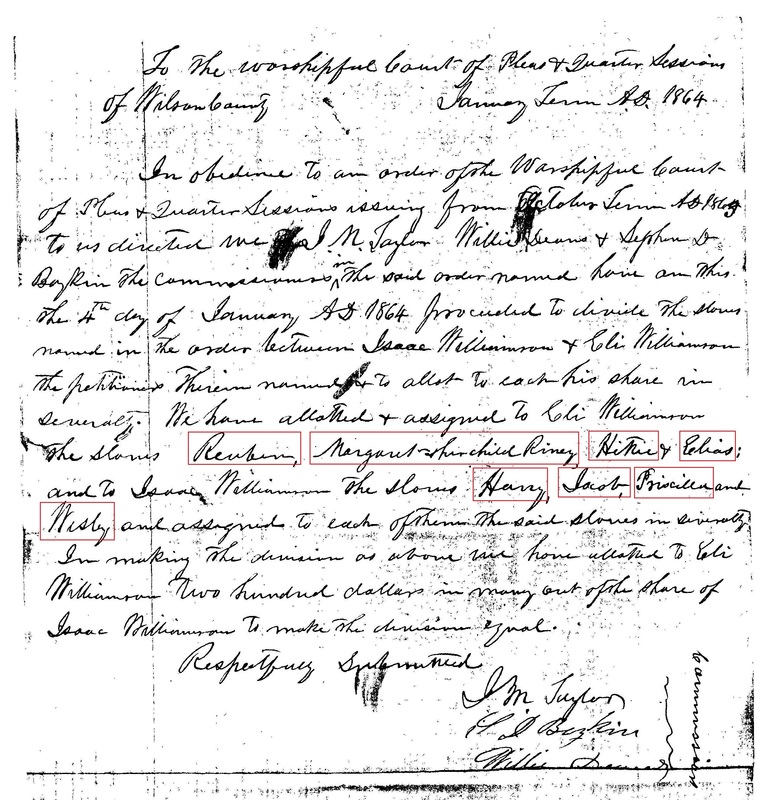 Records of Slaves and Free People of Color, Wilson County Records, North Carolina State Archives. ← I’m aiming to get back home and die there.